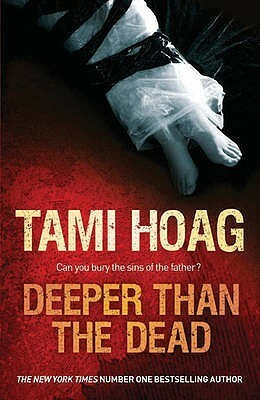 I’ve seen Tami Hoag’s name on books for years. I never thought much of it; I never wondered what sort of books she wrote or why she was so popular. Then I saw Deeper than the Dead on sale for $5 and decided I’d give it a shot. This is another audio book offering, by the way. Some 5th graders stumble over a woman’s body buried in a shallow grave. This is a small, California town with low crime rates so this is a big deal. As the investigation continues, it’s discovered that they may have a serial killer on their hands. The local police, with the unofficial help of an FBI profiler, set out to find who is abducting and killing these young women. Thrown into the mix are the kids who found the body, their teacher, and their parents. The only character I think I could have done without was the over the top, stereotypical gay man who is the best friend of the teacher. Every scene with him made me cringe at the way he was written, and read. The story takes place in 1985 so much of the modern technology used to solve crimes now wasn’t available at the time. I felt like the author focused on this fact a few times too many by making statements along the lines of “it sure would be nice if we had computers” or “someday soon there’ll be a national DNA database that will hold the DNA of all convicted criminals.” Those statements just made me roll my eyes. Here’s the bottom line: the mystery kept me guessing (although I did pick the right perp fairly early, she had me second-guessing) and there were several times I was on edge, captured by the action of the book. I have no idea about any of her other books, but if you like a graphic murder mystery, I recommend this one. I haven’t read Tami Hoag in years. Maybe I should pick her back up!